“Fascination for Innovation” – the slogan clearly reflects SCHNEIDER’s focus on inspiring customers by developing innovative technological solutions. In 1986, after eight years working for the German machine building company Heyligenstaedt, Gunter Schneider founded the SCHNEIDER GmbH & Co. KG. Starting from scratch, his visionary nature paved the way for early success and company growth. Pushing the introduction of CNC technology in precision optics soon offered the opportunity for SCHNEIDER to join the ophthalmic business as a second main market. Innovations have a high priority at SCHNEIDER. The innovation processes are lean and efficiently organizsd in order to implement good ideas as quickly as possible. This is vital for the company, as Gunter Schneider reports: “For us, short development cycles are crucial to secure our position as a leading innovator in the long term.” In fact, on June 27 last year, SCHNEIDER was honored as one of the most successful think tanks in Germany. The company’s motive has always been very clear in terms of working as a reliable partner with their customers to help them optimise the efficiency of their business as well as propagate their growth. In 1994, SCHNEIDER received the request from one of its customers to manufacture atoric lenses with CNC machinery. This initial assignment triggered the vision to develop machines with the capability to produce individual lenses on freely definable mathematical descriptions offering the best visual comfort. By making this vision a reality, the freeform era started. SCHNEIDER was able to produce machines which substituted all previous machines and methods for lens production. “It’s just a file” became Gunter Schneiders slogan for the HSC 100 development – the first freeform generator on the market. Pioneering the freeform idea quickly revealed various difficulties in the previously unexplored domain. For instance, one need was high-speed technology in the form of highly dynamic motors and controllers. However, SCHNEIDER took it up as a challenge and developed all core components with demands beyond existing limits also themselves. In 1998, SCHNEIDER celebrated the world premiere of the HSC 100, the first freeform generator, at the SILMO show in Paris. This initiated the general paradigm change towards freeform machining. Two years later, SCHNEIDER presented the first adaptive-tool polisher at the Vision Expo West in Las Vegas. Since then, many pace-making technologies were developed that enabled cutting-edge positions for many customers worldwide. Currently, SCHNEIDER manufactures products in three different product categories: ophthalmics, precision optics and ultra-precision optics. The company is pioneering the freeform idea since almost 20 years with many pace-making innovations. Continuously following its fascination for innovation, SCHNEIDER extended its portfolio with ophthalmic solutions for blocking, generating, polishing, marking, measuring, tape-stripping, cleaning, coating and edging. With its team of seasoned experts, SCHNEIDER has successfully catered to the evolving needs of the customers in the optical industry. Implemented in leading labs worldwide, the Sprint Line solution for midsize labs is well established in the market since 2009. This compact and fast surfacing line offers the full range of capabilities for high-quality Rx and freeform production without the need of any significant investments. In 2010, it became obvious that a maximum of flexibility and lower production costs to produce high quality lenses could no longer be achieved only by optimising single machines. SCHNEIDERs Modulo Line captures the vision of a systemic approach in which all elements, machines, measurement systems, conveyors and accessories are interlinked in one intelligent system. Following a new self-organising philosophy, the cognitive machines manage the production flow fully self-sufficient all by themselves. With the Modulo Control Center, SCHNEIDER opened up a new world of innovation: This control system, being the first of its kind, is an essential component for controlling the whole machine network with a minimum of effort and a maximum of valuable information. Today, SCHNEIDER builds up single installations and small lines with up to 25 jobs per hour as well as enormous and complex production plants handling several 100 jobs per hour. By dealing with special project requirements SCHNEIDER is able to deliver fully integrated solutions for various demands. In 2013, SCHNEIDER elevated a new one-of-a-kind generator: the HSC Modulo XT. A bundle of exceptionally dynamic new motor philosophy, newly designed high frequency drive technology, new bearing systems, the fastest milling technology and a rigid machine base, shape this ultra-performer. One year later, SCHNEIDER successfully launched a new and fully integrated 4-axis high speed edger which opened up another new market segment: the HSE Modulo. Working with exceptional speed, HSE Modulo sets new standards in performance and throughput. The two separate multi-axis systems enable truly independent simultaneous processing of the lenses – no matter how diverse the job requirements are. Furthermore, SCHNEIDER launched a new and exciting business field: the Schneider coating division. This division is offering most modern hard coating machines like the DHC 40 and AR-coating machines like the EBC 900. A new super coater, the EBC 1400 scheduled for the end of 2015, will help SCHNEIDER to enter the market of high volume batch coating systems. Another milestone for SCHNEIDERs development was the acquisition of another company, called Team H+K, which is known for its expertise in lens de-blocking, cleaning and tinting. In 2014, SCHNEIDER took another step forward in freeform history by developing the Nano Line. This extra small and cost-effective line covers all needs of startups as well as small and partner labs and allows them to produce freeform anywhere. “It really opens new doors for small surfacing operations that need full digital capability at the lowest possible investment,” stated Gunter Schneider. Despite its small size, the line offers the same flexibility that the bigger production lines provide, with no compromise on geometry range or lens quality. The HSC nano generators and CCP nano polisher make up the Nano Line. The extra small and economically priced HSC nano generator is available in two versions. The entry level HSC nano X, with its optional cribbing spindle and built-in laser unit, enables small operations to manufacture virtually any freeform design from any location. The partner lab version, HSC nano XP, includes full milling capabilities for faster processing, and the fast, high quality laser engraving system. The CCP nano polisher combines macro-driven polish results with best-in-practice technology. The unit handles up to 18 dpt curves, the highest range in the industry. Both the HSC and CCP nano machines utilise a simple touch screen interface for easy operation of the intelligent processes. The Nano Lines easy operation concept is a good example of the robust SCHNEIDER technology that allows customers to overcome the existing hurdles when starting their own lens production. As part of the precision optics business, SCHNEIDER offers grinding, polishing and centering machines as well as interferometric measuring systems for various precision optics applications in the fields of endoscopes, microscopy, vision and projection optics, lithography, space applications and many others. The machines are capable of processing all typical types of glass, crystals and IR materials, sapphire, and CaF2. Different machine lines offer various capabilities including the processing of spheres, aspheres, flats, prisms, and complex shapes. Due to the huge variety of customers’ requirements, SCHNEIDER offers a large product portfolio addressing specific needs. The third product division of SCHNEIDER, ultra-precision optics, includes single point diamond turning machines. With these machines metal optics, precision optics components, infrared optics, prototypes of synthetic lenses and mold inserts for replications of synthetic optics can be manufactured. SCHNEIDERs UPC 400 is a flexible processing center for fabricating ultra-precise freeform surfaces with excellent form accuracy and highest throughput. With a single clamping setup, the complete manufacturing and measurement procedure can be done for optics up to 400 mm in diameter. SCHNEIDER currently has more than 400 employees and is located in Germany, the US, Brazil, Hong Kong, Thailand and China. Each year, the company manufactures more than 500 machines in three different production facilities. SCHNEIDER has repeatedly won awards for its innovative equipment and processing solutions, e.g. ‘Hessian Champion’ and ‘Hessian Innovation Award’. Furthermore, SCHNEIDER was one finalist for the ‘German Innovation Award’. SCHNEIDER’s success stems from the commitment, creativity and enthusiasm of the international and highly qualified team. The company is also engaged in various social initiatives and supports worldwide projects especially to improve the living conditions of children. 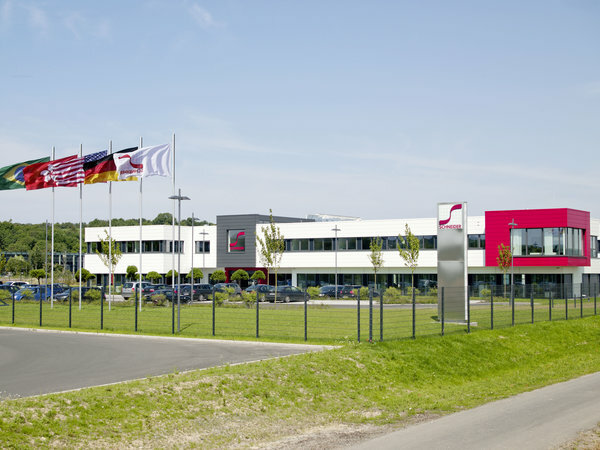 Today, the SCHNEIDER GmbH & Co. KG is one of the world’s leading companies for the development and production of precision optics and ophthalmics. In 2015, after 29 years, SCHNEIDER still represents an independent family-owned company. Following its vision “Fascination for Innovation” the company continues its work of establishing new standards for customers with groundbreaking and innovative products and processes.